Submitted by Denise Azucena on Apr. 15, 2019..
82 out of 100. Incorporating 400+ ratings and reviews. 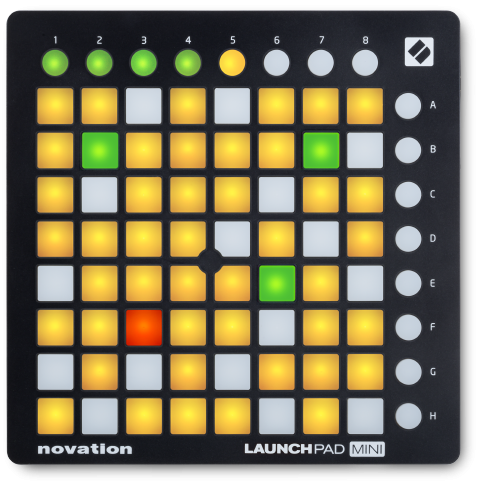 The Launchpad Mini is a compact alternative to Novation's Launchpad Pro. With a lighter and more compact design, it features 64 multi-colored mini pads and 16 programmable buttons for triggering clips, playing drum racks, controlling your mixer and different types parameters. It's class compliant allowing you to connect with any PC or Mac device and iOS devices via Camera Connection Kit. Other than its automatic integration with Ableton, you can use the grid to control parameters in FL Studio’s performance mode. Dimensions: 9.57" x 8.07" x 1.97"
Despite its plastic construction, this controller is fairly durable for its price. Users have reported that it still works after mishandling, such as being dropped. Another main advantage is its size which makes it portable enough to carry around. For home or studio use, the controller doesn't take up too much space either on most users' desks or workstations. Many users gave positive reviews on its intuitive controls when it comes to launching clips or making beats, especially when used with Ableton Live. Its drum pads provide responsive and tactile feedback as well. A few criticized its pads for not being velocity sensitive - some people compensate by adjust note velocity in their DAW. The Launchpad Mini MK2 is a reasonable choice for those who are looking for an affordable, small and compact controller to incorporate in their mobile rigs, however there are more highly rated options available that we recommend in our guide to The Best MIDI Pad Controllers.